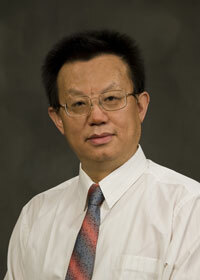 Dr. Wang's research interests include remote sensing, GIS, spatial statistics and their applications to geography, natural and environmental resources with the specific areas: sampling design strategies; human activity and natural disaster induced vegetation disturbance and soil erosion, environmental quality assessment; forest and city vegetation carbon sequestration modeling and mapping; wetland classification and dynamics monitoring; desertification trend monitoring; quality assessment and spatial uncertainty analysis of remote sensing and GIS products. Lu, D., Q. Chen, G. Wang, L. Liu, and E. Moran. 2016. A Survey of Remote Sensing-Based Aboveground Biomass Estimation Methods. International Journal of Digital earth, 9(1), 63-105. Sun, H., G. Qie, G. Wang, Y. Tan, J. Li, Y. Peng, Z. Ma and C. Luo. 2015. Increasing the Accuracy of Mapping Urban Forest Carbon Density by Combining Spatial Modeling and Spectral Unmixing Analysis. Remote Sensing 2015, 7, 15114-15139; doi:10.3390/ rs71115114. Sun, H., G. Wang, H. Lin, J. Li, H. Zhang, H. Ju. 2015. Retrieval and accuracy assessment of stand parameters for Chinese fir plantations using terrestrial Laser Scanning. 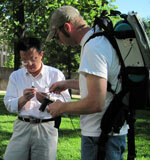 IEEE Geoscience and Remote Sensing Letters VOL. 12, NO. 9, SEPTEMBER 2015. Wang, G., Murphy, D., Oller, A., Howard, H.R., Anderson, A.B., Rijal, S., Myers, N.R., and Philip Woodford. 2014. Spatial and temporal assessment of cumulative disturbance impacts due to military training, burning, haying and their interactions on land condition of Fort Riley. Environmental Management, 54(1), 51-66. Fleming, A. G. Wang, R. McRoberts. 2014. Comparison of methods toward multi-scale forest carbon mapping and spatial uncertainty analysis: combining national forest inventory plot data and landsat TM images. European Journal of Forest Research, DOI 10.1007/s10342-014-0838-y. PI: Shenzhen City vegetation carbon modeling. XianHu Botanic Garden of Shenzhen, China, RMB¥370,000 Yuan (about US$57,800), 01/01/2014 – 12/31/2015 (summers). PI: Annual monitoring model of desertification trend based on remote sensing and ground observation for Beijing-Tianjin sandstorm source control area. State Forestry Administration of China, RMB¥250,000 Yuan (about US$41,000), 01/01/2014 – 12/31/2015 (summers).